The Community / Glendora is a city in Los Angeles County, California, twenty-three miles east of downtown Los Angeles. As of the 2010 census, the population of Glendora was 50,073. Known as the "Pride of the Foothills", Glendora is an affluent city with diverse housing and a consistently high-ranking school district. Glendora lies within the 626 area code of San Gabriel Valley. The city to Glendora's west is Azusa while San Dimas lies to the east. Glendora has its own police force and the town's crime rate is very low. Residences in Glendora range from early 20th-century bungalows, to modest ranch style homes, to multi-story grand mansions. Glendora's most expensive neighborhoods contain many very large, secluded, estate homes with sweeping views across the San Gabriel Valley to Downtown Los Angeles. 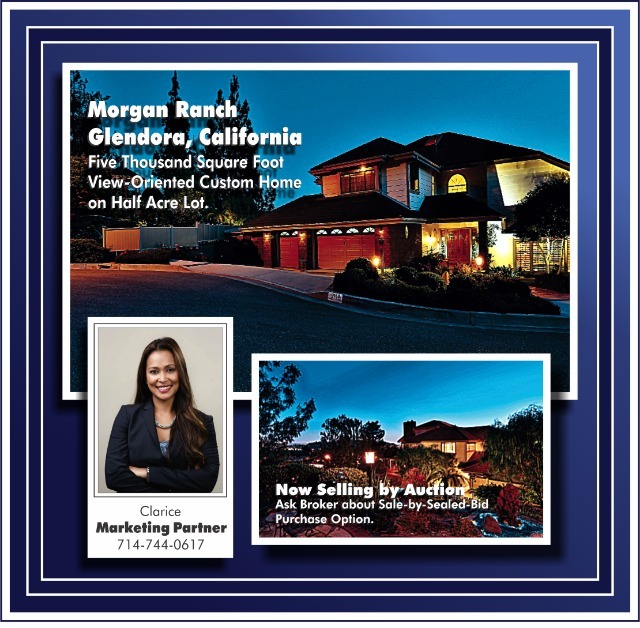 These neighborhoods include Morgan Ranch, Gordon Highlands, Bluebird Hill, Silent Ranch, Oak Tree Rancho, Hidden Springs, Oakhart Estates, and Easley Canyon Estates. Membership in the Glendora Country Club is by invitation only and has been played by many professional golfers. Glendora also owns a nine-hole golf course, Glen Oaks, offering a driving range, instructional services, a practice area and the nine-hole, par three course itself. In the California State Legislature, Glendora is in the 25th Senate District, represented by Democrat Carol Liu, and in the 48th Assembly District, represented by Democrat Roger Hernandez at the time of this writing. In the United States House of Representatives, Glendora is split between California's 27th congressional district and California's 32nd congressional district, which are represented by Judy Chu (D-Monterey Park) and Grace Napolitano (D-Norwalk, respectively at the time of this writing. The Los Angeles County Department of Health Services operates the Monrovia Health Center in Monrovia serving Glendora and, lastly, Glendora celebrated its centennial as an incorporated city in 2011. The owner of this property – a former Disney Imagineering executive – functioned as a Project Director of Architecture and Engineering for Disney Imagineering, worldwide, for nearly forty years and headed teams for designing and building many of the company’s standout parks and attractions. These responsibilities, as you can imagine, required a skillset enabling an ability to focus on the components or elements of a structure or system and a capacity to unify them into a coherent functional whole. Hmm, sounds like the build-out of some of the fantastic attractions we so love and enjoy at Disneyland. Possibly, the most important function among the wide variety of artists, architects, construction superintendents, contractors, skilled craftsmen and the like that work for Disney Imagineering is the Project Director. Imagine, now, what he would have done with his own home. This Furniture Included property stands out as a master work of art as well as what we always refer to as a custom crafted home jammed packed with every amenity you would expect of a top shelf five-thousand square foot estate. The rear landscape architecture which includes a view-oriented outdoor dining area, meticulously designed pool and spa, hillside trails with meditation areas and cozy getaways, lush low-water landscape, though laced with mature pines, is very Disneylandish throughout; a delight to behold. Did I say Furniture Included? Very important, now, and again like something you might imagine a Disney company’s project director to do, is that the home has been fitted with moneysaving devices like a fully paid for (not leased) solar power system that functions so well that annual energy use averages only $130 a month, even when running two five-ton 16 SEER air conditioners nearly full time during the summer. Without this cost saving facility, energy costs could average $400 a month, peaking at approximately $1000 a month in the summer. The upgraded moneysaving water softener and hot water recirculation pump can run without incurring extraordinary costs because of special engineering as well. See the “Detail” link on the sidebar to the left to peruse a list of home features and improvements not found in your general run-of-the-mill custom home wherever located. Meticulously maintained and upgraded throughout, only a home tour can suffice to define the features that imbue this property with a must-have sense of urgency upon a first visit. Oh, yes, one more thing. You would expect that a Disney exec would build a top-of-the-mark in-home theater with reclining seats into their home, wouldn't you? This property features one of the nicest in-home theaters I have even seen. Furniture Included means this all stays, less personal accessories and possessions and collectible fine art throughout (a detailed list provided upon offer). You will, of course, want to personalize your interior design. Initially, though, the buyer of this property can save tens of thousands of dollars by moving into a substantially complete, turnkey property meticulously furnished both in and out. The Morgan Ranch Estate is now selling by both conventional means and by auction. This is a strong indication of a willingness by the seller to consider reasonable bids. The Morgan Ranch Estate Can be Seen Most Any Time by Appointment. Three year old solar power system, owned not leased. Electrical panel was upgraded three years ago. Solar tinting on high sun exposure windows. Hardwood, marble, and porcelain tile flooring except new carpet in the living room, stairs, second floor hall, bedroom two, and home theater room. Granite and marble counter tops throughout. Living room, family room and master bedroom each have a fireplace. All fireplaces can be either gas or wood burning. Upgraded kitchen with all new energy efficient appliances including double convection ovens, all induction cooktop with pop up down draft ventilator, under counter drawer type microwave oven and wine refrigerators. Large hillside retreat area with great views, a gazebo, outdoor fireplace and extensive seating areas and lighting. Pool area includes newly refinished pool and spa (PebbleTech), new energy efficient gas pool heater, built-in bench seating, newly resurfaced deck areas, and outdoor covered winebar. Energy efficient heating (gas) and air conditioning systems one each for first and second floors installed three years ago, includes two five ton 16 SEER condensers. Water softener and hot water recirculation pump. Sewer line from the house to the street was replaced this year. Garage has built-in storage cabinets, a work space, and new garage doors with premium openers installed two years ago. Upstairs bedrooms have great views. All bedrooms are large and have direct access to the pool area. Master bath has been upgraded and includes: dual sinks, shower, privacy toilet, large chromatherapy air bubble massage tub and high end plumbing fixtures. Office includes built-in granite top credenza with cabinets above and 12 ft. high boxed wood ceiling. Family room includes a bar with back bar and sink. Upstairs bedrooms two and three have built-in desks. HOA fee is $288 a year. Features and Details provided by Seller. Deemed reliable, but not guaranteed by Broker.